Poor Ringo. Sparta's dog got killed during the mission today to recover Ozi's slaves. He was ferocious as ever one second, and then wham, he got the life sucked out of him the next. Oh, and Miqulius and was killed by the necromancy spell too. Hmm, have I mentioned that man before? He is one of Ozi's friends I think. I guess that makes him my friend too... but I knew Ringo for longer! And besides, Miqulius was only dead for a few seconds thanks to Wintersky's abilities. The rescue plan went off without a hitch, at least to begin with. Mask used group invisibility spell to take us all into the House Elan, and then we found most of Ozi's countrymen on the first floor. We didn't even have to fight anyone to do it! Makes you wonder why the slaves hadn't already walked out the front door. After we set the first batch free, Wintersky let us know that there were more waiting on the top floor of the tower. 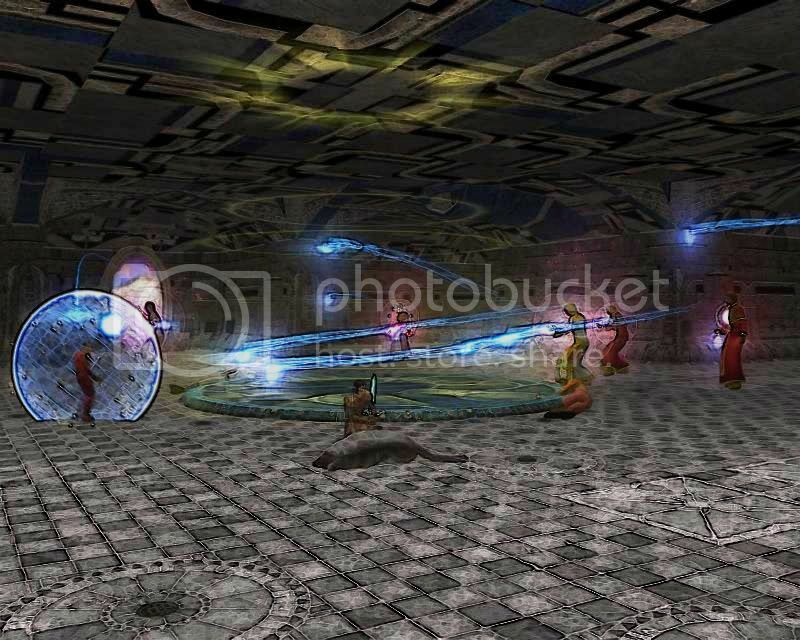 When we entered the apex, we found a single sorceress waiting for us in a room filled with portals. She managed to set off an alarm before getting cut down by our group's swords. Ouch. Stupid weasel has a sharp bite. I shrugged off the pitiful missiles in Athena-form!